It took a lot of experimenting to remake pesto into a delectable vegan dish. We’ve tried just removing the parm, but it wasn’t quite right. We tried nutritional yeast, different spices, different kinds of faux cheese, switching pine nuts for sunflower seeds, walnuts or pistachios. But one day last summer, we stuck gold. The missing flavor was the salty, briny parm. Well… miso tastes like that, too. Score! 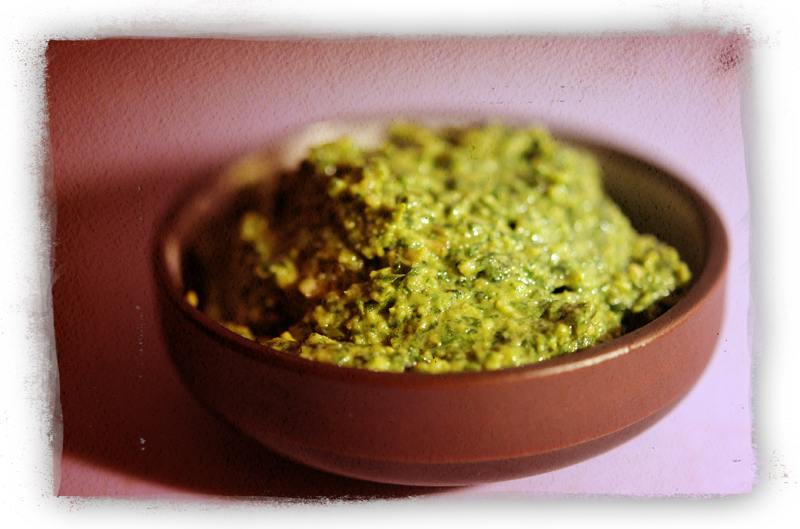 Here it is, a perfectly balanced, simple basil pesto – vegan style. In a food processor or blender, grind up the garlic and pine nuts. Add the miso and basil leaves, and pulse as you pour in the olive oil. It’s done when the pesto is smooth and blended. This recipes makes about 1/2 cup, which is around 3 portions. You can toss it with your favorite cooked pasta, sauted veggies. It’s great in sandwiches, on crostini, or – as a pizza sauce. 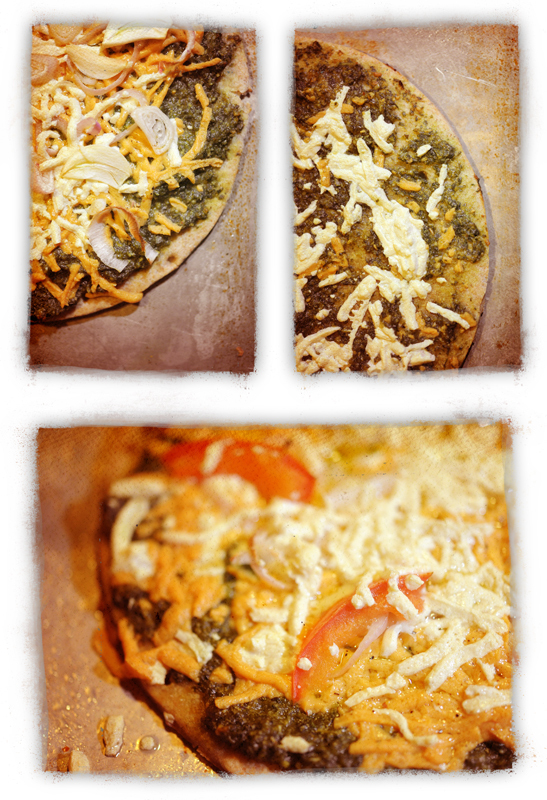 We made several small pizzas with pesto, Daiya and veggies. So good! Our pals Amy and Rachel make some awesome treats. Recently they sent this delicous homemade White Wine & Tarragon Mustard. OMG. It’s as good as it sounds. We have been eating it slowly, to savor every precious bite… we’ve had it on grilled veggies, on sandwiches, on pretzels. 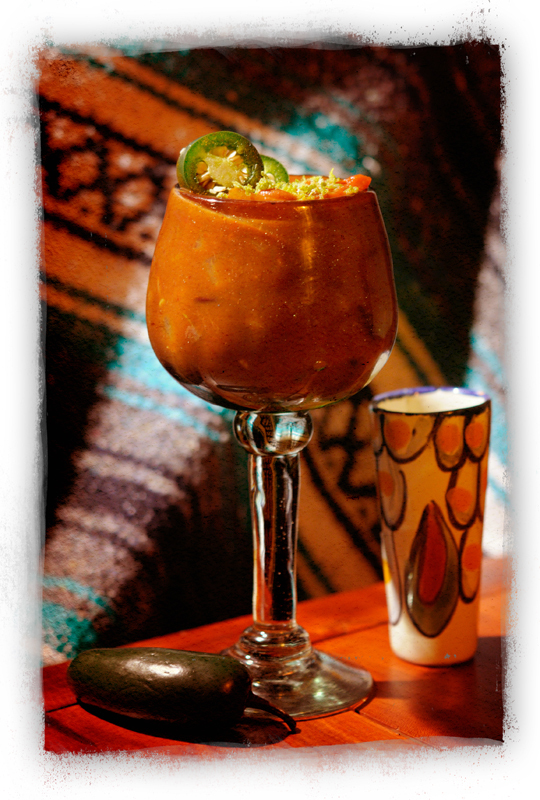 It’s complex and flavorful with a thick, fulfilling texture. Mustard-y, spicy, herb-licious. The recipe for White Wine & Tarragon Mustard is posted on the website for PCC Natural Markets. I can’t repost it here, but you can log on and check it out. The ingredients are very simple, and one batch yields about 2 1/2 cups. There’s even a video on there. How cool is that? You can preserve it using a canning method if you like. But really, for us, it wouldn’t last very long. Try it on, well, everything you’d put mustard on. 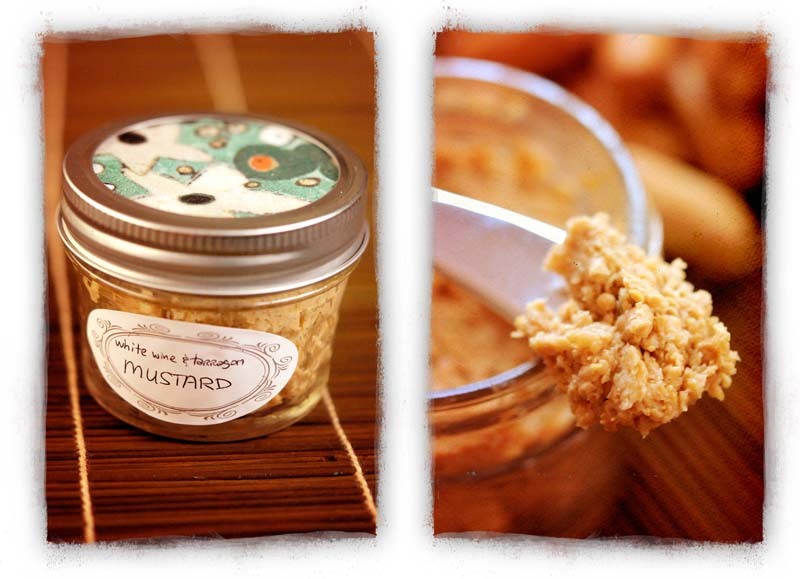 Thanks Amy and Rachel – we LOVE this mustard and can’t wait to whip up another batch! It’s not exactly candy, but it’s sure sweet and we love this stuff. You can pack it in your lunch bag – or your child’s – and have a tasty pudding snack to go. Soyummi Puddings are not only cute and remind us of being kids again, but they’re also vegan, gluten free, low fat and kosher. Love it! The founder, Joanne Hollander, creates her foods on the same principles she uses to feed her own family – real food, no GMOs, no fake anything, no additives. Mad props to you Joanna. And I have to say – the result is delicious. Making a tasty vegan & gluten free pudding is no small task. But Soyummi is the real deal. I’m pretty sure you could drop one of these into anyone’s lunch sack or picnic basket and they’re gonna love it. The Soyummi Dark Chocolate Pudding is the DH’s favorite. It’s rich, decadent and tastes like real chocolate – but with the ideal smooth texture of pudding. My fave is rice pudding. Let me just say – I would be embarrassed to note on this blog how many times I have unsuccessfully attempted to create my own vegan rice pudding recipe. No more tears for me. Now I have Soyummi Rice Pudding. It’s heavenly. Creamy, with sweet, chewy rice and a well-balance mouth-feel. Lovely. Soyummi also makes a Tapioca, Cherry Pudding and Lime Pudding. We haven’t tried those yet – but they sound promising! The website at Soyummi is pretty cool too. There’s even a recipe for rice pudding pie! Sign me up! They have a locator, so you can find a Soyummi retailer (dealer might be a better word… 🙂 near you. Everyone likes an easy side dish. Easy always works. And the thing is, this one is so good. It’s the recipe we get asked for at family events and potlucks more than anything else we’ve ever made. No one believes how simple it is. Even my nephew who “hates veggies” has been known to go back for seconds of this. I think it’s the white pepper that sets it just a little apart from normal. You decide. Pre-heat oven to 350. 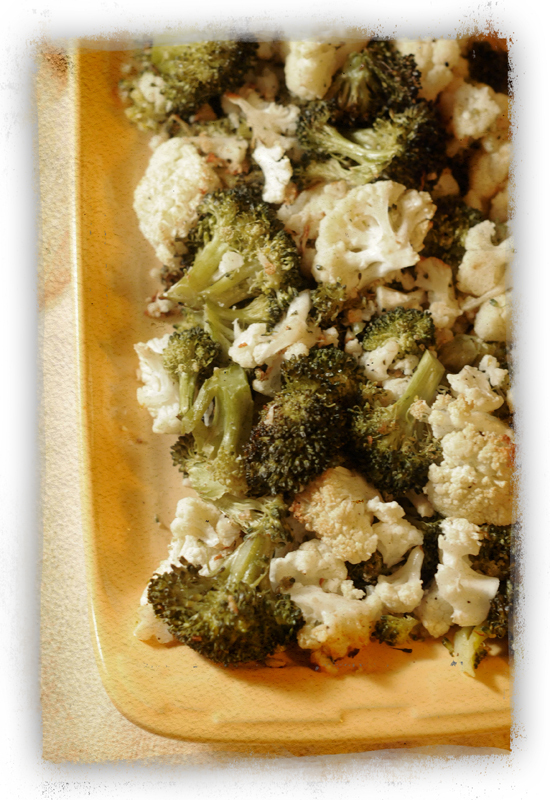 Make sure cauliflower and broccoli pieces are a uniform size, so everything cooks evenly. In a large oven-proof casserole dish, toss broccoli, cauliflower, oil, salt and pepper until the vegetable pieces are well coated. Roast in oven, uncovered, about 90 minutes, stirring every 30 minutes. When done, the broccoli and cauliflower will be lightly browned and very tender. The slow roast is key to bringing out the sweetness in the veggies. Serve warm beside your favorite supper, lunch or brunch main. The dish is crazy easy. We stumbled into it once when we were feeling lazy and it ended up being something we have made over and over for years – every loves it. And it’s simple enough to double for a crowd. Try it once – you’ll see. Enjoy! We live in a cozy little town called Catonsville. It’s in Baltimore County, but when you’re here it’s easy to forget you’re near a major city. It’s a neighborly, white-picket-fence kind of community. And Atwater’s Bakery & Cafe (full name is Atwater’s Naturally Leaved Bread Bakery & Cafe) is just the kind of homey establishment you’d expect to find in a cozy place like Catonsville. 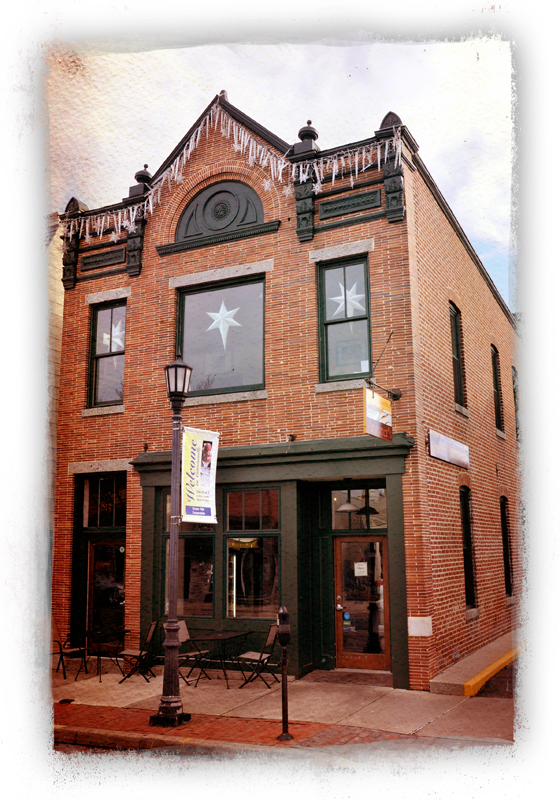 Situated at 815 Frederick Rd., Atwater’s is in the heart of the Catonsville’s downtown district. And it seems to work like the heart of the town, too. There has never been an occasion we’ve gone in when Atwater’s wasn’t abuzz with activity. Folks are constantly coming and going – getting bread, lunch, coffee and treats. First, let’s talk about the awesome eats. True, when you walk in, you may not immediately guess Atwater’s is a haven for vegans – but it is. They absolutely have delicious meatless offerings – starting with the Banh Mi Tofu Sandwich. This little beauty is a solid meal and packed with goodness. There’s a generous portion of tofu, carrots, cucumbers and lettuce, all dressed in a tangy Asian-inspired vegan sauce on one of the bakery’s delish rolls. This picture barely does it justice, because when you go to bite into the sandwich it’s so thick, you can’t even fit your mouth around it. The Banh Mi is one of those sandwiches that when you eat it, sauce is dripping down your hand and chunks of veggies fall onto the plate. People stop and ask what it is, cuz it looks so good. Seriously. We have eaten them for breakfast, lunch and dinner. No joke. Still hungry? No problemo. Every day brings a different soup special at Atwater’s. The daily soups come in Tiffen boxes: cylinder-shaped, three-level metal containers. The top level is your savory soup; the middle, a chunk of Atwater’s bread; and the bottom, a fresh cookie. This arrangement is incredible – but for one thing… the cookie isn’t vegan. Boo. We are hopeful that one day, Atwater’s will have a vegan cookie option. In the meantime, we usually find someone to give the cookie away to – a friend or client or something. The cookies look quite good – people really enjoy them. 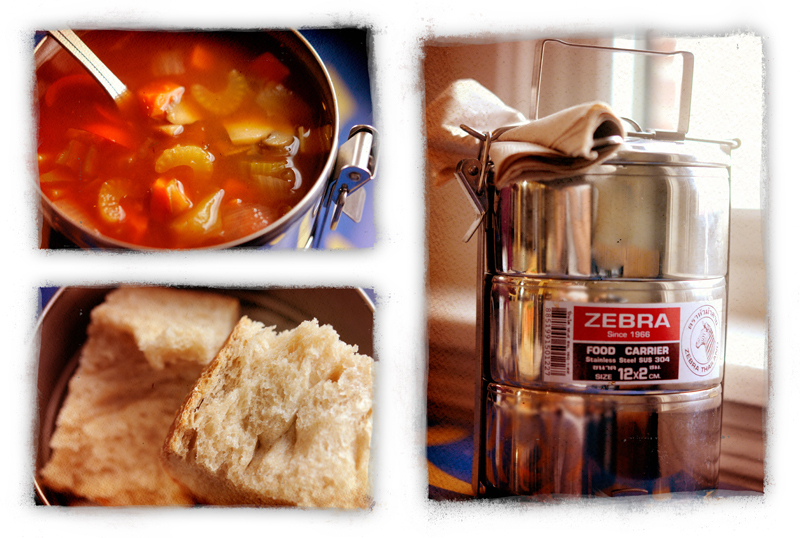 The Tiffen below contains a very tasty, hearty vegan Mushroom Goulash, served with a chunk of fresh bread. Mmmm… It was so good, I can’t even tell you. You’re just going to have to hope you’re lucky enough to go in sometime when they have it. Now, in all honesty, there isn’t a vegan soup special every day, so be sure to call in advance . They do list them on their website, but on more than one occasion, the website was wrong, so it’s easier just to call and be sure. But at least a few times a week, one of the offered soups is vegan, and all summer long, they have vegan gazpacho, which is just heavenly and perfect for warm days. We’ve been told by the counter staff at Atwater’s that these are a big seller, among vegans and non-vegans alike. We’ve gone in just for these brownies on many occasions only to discover they were sold out. To this I say: Hey, non-vegans! We are glad you are excited about a vegan treat, but please leave some for us!!! 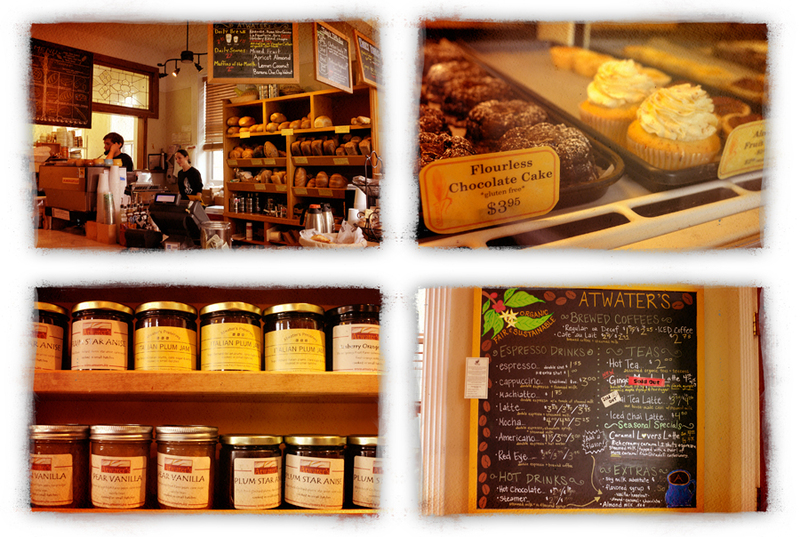 There is no shortage of other treats for you at Atwater’s! Eat a scone or something. Best suggestion – when you go in, just buy a few brownies, like two per person in your family. You don’t want to risk eating them all in the car and then not having enough for dessert later. Nowadays, we usually get three or four. They never, ever go to waste. Sometimes, we just sit and eat all four in the car. Sigh. Oh well. Atwater’s isn’t just food, though. They also offer a fabulous variety of beverages. You can get hot tea, iced tea, fresh squeezed lemonade ( ssoooo good!) and an array of freshly-made barista style coffee drinks. Oh – and you can get those made vegan with soy milk. Like this gorgeous little cappuccino. Have you ever seen such a pretty coffee drink? You almost don’t wanna drink it… almost. There’s a lot of green too. By which I mean Atwater’s is a very eco-friendly place. Every aspect of the operation and design of the bakery/cafe gives thought to the environment. The dining area is open and bright with loads of natural light and ceiling fans. The huge table in the middle of it all is repurposed wood. They offer free tap water and re-use soda bottles for sugar. Atwater’s really does go above and beyond when considering the sustainability of their business. Oh -and – they source their food locally. You can even find a list of their providers right on their website! How cool is that? You know, I’ve heard it said that bread is life. Well, once you try Atwater’s bread, you will agree. If this is the only bread you have for the rest of your life, you will be a happy eater. They offer 100% Whole Wheat, Peasant Wheat, Sunflower Flax, Raisin Walnut, Caraway Rye, San Francisco Sourdough, Cranberry Pecan, Kalamata Olive, 10 Grain, Country White, Spelt, Ciabatta, Rosemary Italian, Raisin Pumpernickel, Struan and Jalapeno Cheddar. Of these, only Struan (honey & buttermilk) and Jalapeno Cheddar (cheese) are not vegan! Did I say it already? Shwing! 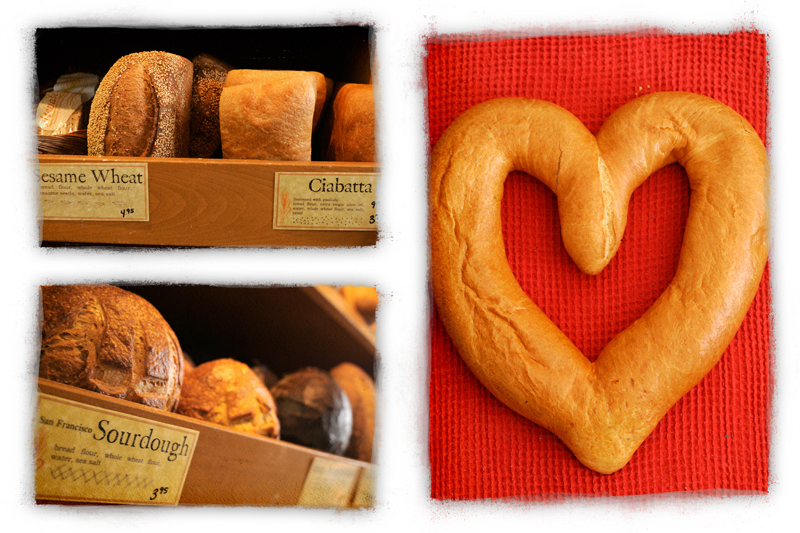 The breads are hand-crafted and completely gorgeous. You feel like you are in some old European village, smelling the loaves of bread, admiring their glossy golden crust – oh and when you eat some – you will never, ever want any other bread again. It’s totally addicting. We’ve sat down with a loaf of the Rosemary Italian and some olive oil and eaten the whole thing more than once. Other goodies abound at Atwater’s, too. There are many delectable-looking pasties in the case, some are even gluten-free (though at the time of this writing, only the brownies are vegan!). As far as we know, all the baked goods are vegetarian, though. There is a huge shelf of bottled and jarred foods. They change a lot – you’ll find items as varied as pickles and hot sauces to canned tomatoes, jams/jellies, chocolate bars, fresh flour and chutney. And of course, coffees and teas to brew at home. Almost everything on these shelves is usually vegan. Though not pictured, Atwater’s also has a cold case. There are usual items always there: fresh/local milk, cheeses and eggs for vegetarians are regularly available as well as bottled/chilled tea and juices. The Banh Mi Tofu Sandwiches live in the cold case and they often offer other vegetarian sandwiches with cheese. There are salads and soups and sides – it’s literally different every day you go in. We’ve scored some very good noodle and grain sides here, as well as wonderful crisp salads and vegan soups to eat at home. Basically, the food is so fresh, you never know what you will find! The attentive counter staff bears mention as well. When we have any questions about any ingredient or item at Atwater’s, the staff goes out of their way to help us. Each of them have proven to be knowledgeable about vegan food and never once have we gotten the blank spacey stare of someone who was clueless or didn’t care. You run into that look a lot when you’re a vegan, so it’s refreshing that the customer service has been so great at Atwater’s. Thanks for taking care of us, everyone! 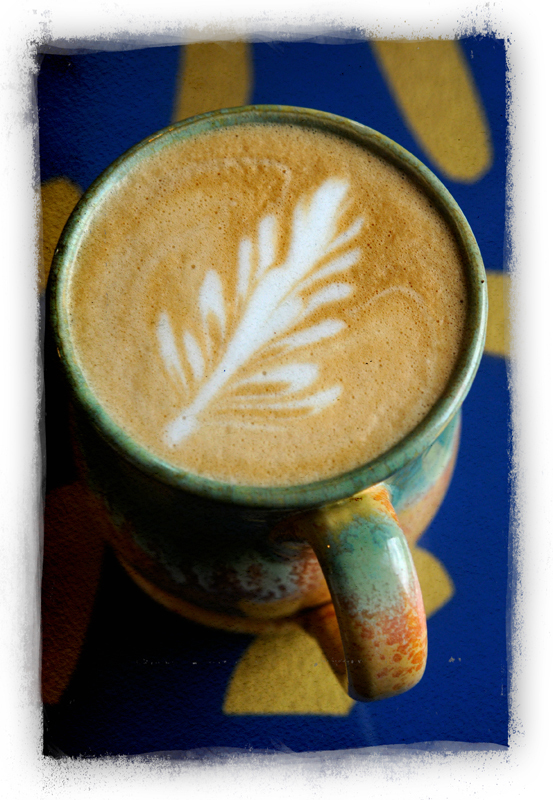 Atwater’s Natually Leavened Bread Bakery & Cafe is located at 815 Frederick Rd, Catonsville MD 21228. They have a parking lot on the side of the building, and if it’s full, there is on-street metered parking available. They’re open seven days a week for breakfast and lunch. You can find them on Facebook or call 410-747-4120 for the daily soup specials. If you are in the Catonsville area and want some fresh, awesome vegan eats, you gotta give Atwater’s a try! Oh – and drop us a line if you’re going. We’ll meet you and eat some brownies. Update! The folks at Atwater’s wanted to let everyone know, the soft white rolls have butter and milk. Not the country white bread, but the little round white rolls. Thanks for letting us know! Today’s recipe is a special one. It was written by request for a wonderful lady named Reena. She is the owner of the always-chic, super-green eco-artware.com We ran into her recently at an environmental conference and she was asking if we had any good recipes for leftovers. 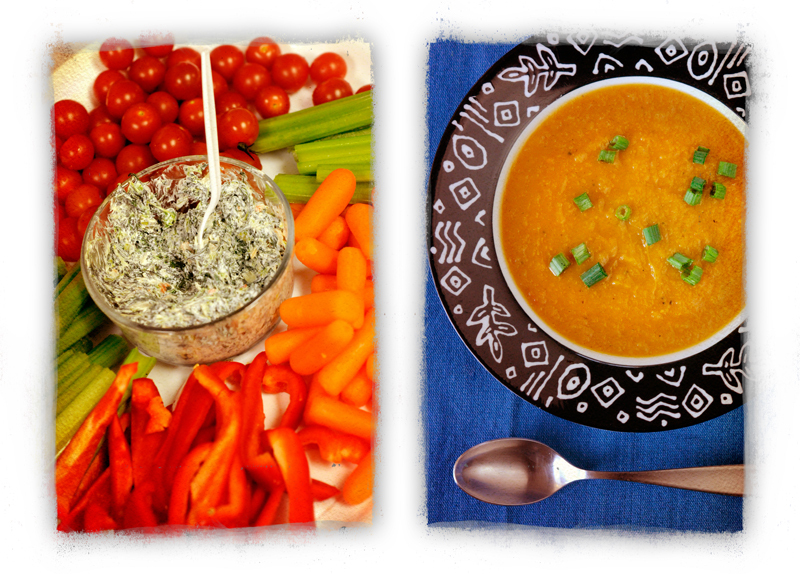 We were only too happy to tell her about our crudite soup – it’s the ideal solution for leftover veggies! Ever get a veggie tray for a party? You know, the kind with carrots, celery, broccoli and cherry tomatoes – all sliced up and ready for dips? Sometimes they also have spring onions, pepper slices, snap peas, zucchini/squash or cauliflower, too. Somehow, we always end up with a smattering of random veggies after we serve a crudite platter. There’s never the same amount of anything leftover. But from this we developed one of our favorite vegetable soups. Now we hope that guests leave behind veggies, so we can make soup from what’s left. This recipe isn’t perfectly precise – it has some flexibility, based on what you have leftover on your vegetable plate. Think of it more as a formula. You can also use most vegetables you have around to fill it out, even if they weren’t crudite. We’ve added potatoes, sweet potatoes, onions, garlic, peas, corn and canned tomatoes into the mix. The fun thing is, this recipe will never be the same thing twice and – you get to use up some leftovers! Vegetables might include: carrots, celery, broccoli, cauliflower, cherry tomatoes, spring onions, pepper slices, snap peas, zucchini, squash, potatoes, sweet potatoes, onions, garlic, peas, corn or canned tomatoes. Measure all vegetables together for your total quantity. Liquid can be water, vegetable stock or plain soy milk. Whichever you have on hand, or in combination. Apply the formula and all your vegetables and liquid to a large soup pot. For example, if you have leftover carrots, celery and peppers, plus and 1/2 onion from the fridge, chop them all into approximately equally sized pieces. Then measure them and add to your soup pot. If you have 4 cups total veggies, add 2 cups of liquid, like vegetable stock. For every one cup of veggies, we also add a teaspoon of seasoning blend. Some we have used: Italian Seasoning blend, Garlic and Herb, Lemon Pepper, Thai Seasoning, and Grilling Blend. It’s whatever you have on hand. If you prefer blander foods, use half the amount of seasoning blend. If you like heat, try a few splashes of Tabasco or other hot sauce. Cook over medium-high heat to boiling, then cover, reduce to low, and cook for about 20-30 minutes to soften vegetables. Check and stir every 10 minutes or so. If too much liquid has cooked off, add a little more. The liquid line should be about 1 inch or less from the top of the vegetables. When the veggies are soft, turn off the heat and use an immersion blender to puree the soup into a smooth, silky texture. If you don’t have an immersion blender, you can do the same thing in batches in a regular blender or food processor. Serve warm with your favorite bread or crackers, or pour over rice as a sauce. Enjoy your leftovers! And be sure to check out the cross-post of this blog on eco-artware.com’s notebook! Seriously, who doesn’t love a deal? I mean, even if you have some spare change in your wallet, a good price on something is still welcome, right? In the spirit of being green and saving green, you’ve gotta check out these two websites. First meet Vegan Cuts. This site is run by a vegan couple, Jill and John, with the help of three other folks and has a mission to help people shop vegan and support vegan businesses. The Vegan Cuts mantra is: Shop Vegan. Save Money. Save Animals. Their newletters arrives weekly with a main feature – sometimes a health/beauty product, sometimes food, sometimes wardrobe. The main item is offered for a limited time at a substancial savings. 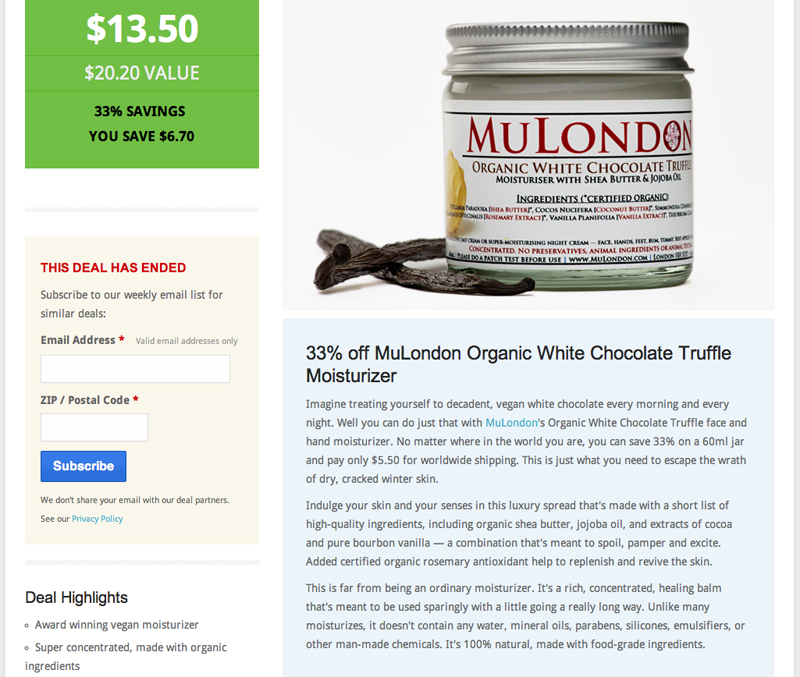 Like this little beauty below… who wouldn’t love a luxurious jar of white chocolate truffle moisturizer? Yes please! Vegan Cuts doesn’t stop there, though. Even after the awesome weekly newsletter deal, you can stop by their website anytime and browse the available items. At the time of this writing, they had shoes, lotion, shirts, handbags, jewelry, candy and – vegan nacho cheese! All at discounted prices! Ready to save even more green? Now it’s time to visit Green Deals. 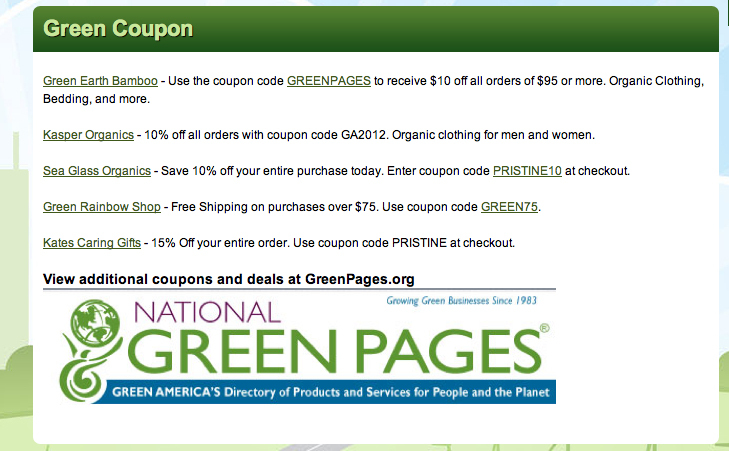 Green Deals is a shopping site hosted by the good folks at Green America. It also offers a weekly e-newsletter with a featured deal, like Vegan Cuts, but the deals really run the range. You can find solar-powered flashlights, fair trade coffee and chocolate, yoga mats, ZipCar discounts, clothing, shopping bags, glassware – even vacations. And to really sweeten the deal – these are Green America-approved merchants. To quote from the Green Deals website: Green America’s Seal of Approval recognizes companies showing deep commitments to people and the planet in their policies, practices and products. To receive the Seal, companies complete a rigorous screening process to verify their commitments to social and environmental responsibility. 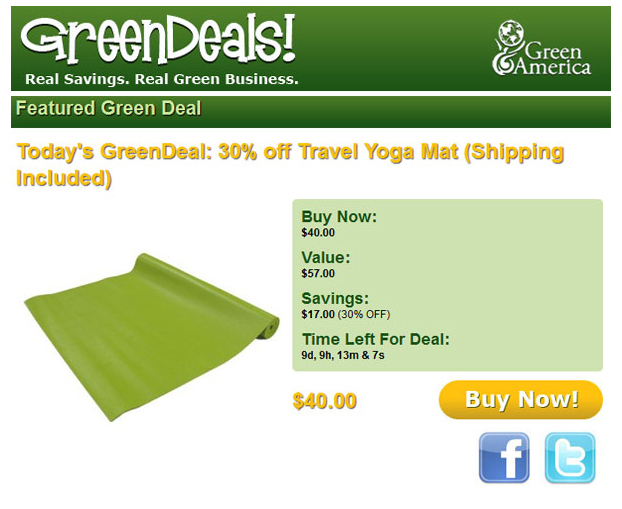 That’s why you know that a deal from Green Deals is truly green. The Green Deals site also offers online shopping and regular coupons, like those below, that you can use for all sorts of shopping needs. So there you have it. Shop with wild abandon on Vegan Cuts and Green Pages – you’ll score some excellent eco-loot and save green at the same time. Sometimes we miss cream sauces. You know, the ooey gooey stringy cheesy pastas. So we tried to re-invent it with Daiya. The results were pretty tasty and will fill the void if you, too, are dreaming of a creamy pasta supper. Cooking gnocchi according to package directions. Don’t overcook, or your gnocchi will fall apart. When you drain, reserve about 1/2 cup of the cooking water to make your sauce. Make sure the cooking water is hot for the next step. In a large bowl combine Daiya, lemon zest, lemon juice, fresh sage, hot cooking water and white pepper. Stir vigorously to melt the Daiya and create a smooth, creamy sauce. Keep stirring, it will get there. 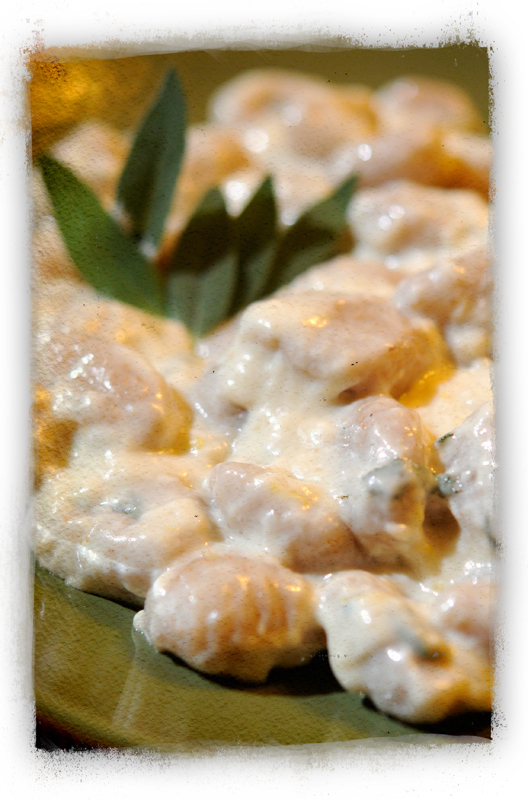 When the sauce is smooth and you are happy with the consistency, add in the gnocchi and toss to coat. Enjoy your creamy pasta! Note: We don’t add salt to this recipe, because we feel it doesn’t need it, however, feel free to experiment with the flavor profile – add salt, cayenne, whatever you like! Our favorite kind of gnocchi is Trader Joe’s Whole Wheat Gnocchi. This time of year, fresh tomatoes are not exactly at peak. Thank goodness for canned! Chili is very good with fresh tomatoes – but just as good with canned. We love to mix it up with chili. In fact, in college, I used to try inventing new veggie chili recipes all the time. Because the DH loves margaritas, this recipe was developed with him in mind. It’s delicious all by itself, but also great on nachoes. Oh, and like most chili, it’s even more flavorful the second day! In a large soup pot, saute onion in canola oil until wilted. Add in garlic and red pepper flakes. Cook about 1-2 minutes more, until garlic and chili are fragrant. Add beans, tomatoes, chili powder, jalapeno and orange juice. Turn heat to low,cover pot and simmer chili about 20-30 minutes until broth thickens and flavors are combined. Add in agave and tequila. Cook about 3-5 more minutes. To serve, stir a pinch of lime zest and a few teaspoons of lime juice into each bowl. The brightness of the lime will pull the whole dish together. This is excellent with a dollop of soy sour cream, some tortilla chips – and of course, a margarita! Bamboo has always seemed gorgeous to me. Those tall, graceful stalks. That lush green color. So beautiful. It never occurred to me, though, that bamboo could make me prettier! Who knew bamboo translated to awesome beauty products? Maybe you did, but it was exciting news to me. A great company called EcoTools creates make-up brushes from bamboo and recycled aluminum. They are 100% cruelty free, too, with bristles made of synthetic taklon. I got a set as a holiday gift and love them. My EcoTools brushes are insanely soft and blend make-up smoothly. In fact, I like them better than I did my older brushes! EcoTools is a member of 1% for the Planet®, an alliance of businesses that support environmental initiatives. Each member donates 1% of annual revenue to environmental causes. EcoTools‘ annual donation goes to both EarthShare® and Wildlife Alliance. EcoTools are available in sets or as individual brushes. As you need to replace your make-up brushes, you should definitely give these a try ~ they are eco-friendly, vegan and a great product! But wait – there’s more bamboo awesomeness! Also over the holidays I got a Bamboo Wear compact with a refillable bronzer. This line of make-up by Physican’s Formula contains bamboo silk in the make-up, the compact cases are crafted from bamboo, and the make-up container itself is recyclable. The bottom of the Bamboo Wear compact even contains a bamboo application brush, though I’m not sure what the bristles are made of. The coolest thing about both EcoTools and Bamboo Wear is that they are easily accessible at most stores – Walgreens, Target, even our local grocery store carries them! Now you can get pretty and be sustainable with gorgeous bamboo!